WinADayCasino.com has added another new game to its collection of one-of-a-kind online casino games. Chinatown is an exotic tribute to the bustling Chinese communities that have developed in major cities around the world with noodles, lotus blossoms and Ming vases spinning on its five reels. Chinatown is a 21 pay line video slot with an expanding Wild symbol and chances to win up to 15 free spins. Players can bet from $0.02 to $4.00 per pay line and win up to 1000 times their bet. Three or more Lantern symbols anywhere on Chinatown’s reels triggers five free spins. Four Lanterns wins ten free spins and five wins fifteen free spins. The total win from free spins is shown on a special display and is transferred to the player’s cash balance once all the free spins are played. An animated Sword is the Wild symbol. It expands onto the entire reel and substitutes for any other symbol on a pay line. Unlike other slots where the Wild appears only on certain reels, this Wild symbol can appear on any of the five reels making the win even juicier. This week a series of special slot tournaments celebrates the launch of the new game. Everyday the top five Chinatown tournament players will receive bonuses up to $150 from a total slots tournament prize pool of $2400. Until Sunday, everyone playing the new game is automatically entered in the tournament and listed on the leaderboard. Chinatown celebrations continue on the 19th with a $19 no-deposit bonus. Top Bettor prizes up to $500 will be awarded next weekend and deposit bonuses up to 35% will be available October 22 – 23. Like most of the slot games at WinADay, Chinatown is tied to the site’s progressive jackpot which is currently over $170,000. In Chinatown, spinning five Bronze Head symbols with a bet of at least $5 wins the progressive jackpot. WinADay is a no download casino with 27 unique games including slots, video poker, Keno and Roulette. 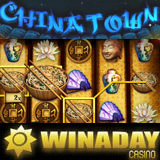 Like all of the casino games at this innovative online casino, Chinatown is available only at WinADayCasino.com. Meet other WinADay players and receive special casino bonuses on Facebook: www.Facebook.com/WinADayCasino. totally love the new game, awesome graphics, bonus round and it seems to pay well! Just watched the video for the new game from WinADay, looks great, I cant wait to play it!